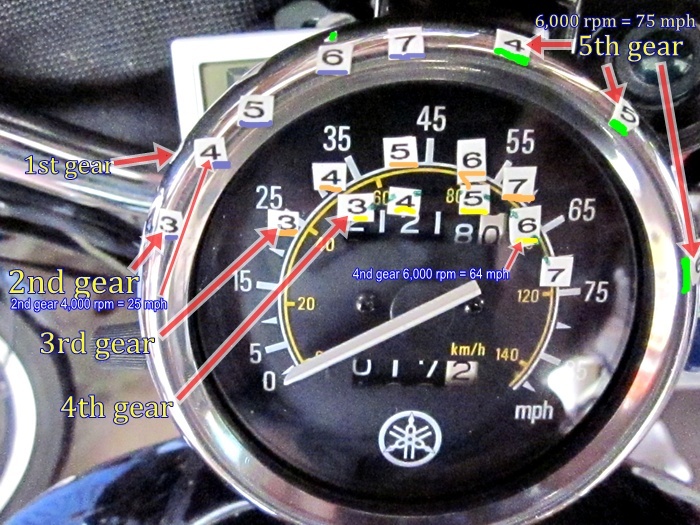 See end of post for paper tachometer overlay you can print out and put on your Virago 250 speedometer. I was driving to work this morning and I just happened to notice that my exhaust note was an “E” pitch at an indicated 50 mph in 4th gear. The “E” is 82.407 Hz; multiplied by 60 equals 4,944.42 rpm. 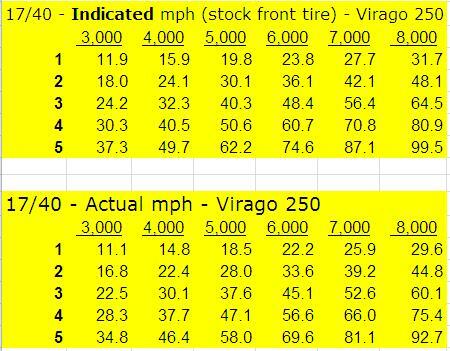 Using this information, I made new Virago 250 speeds-in-gears charts. 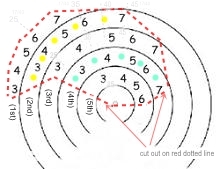 Once you have the above chart for your sprocket combination, it is easy to “make your own tach” by carefully sticking tiny numbers on the face of your speedometer. You can fit gears 3 and 4 below the mph area, gears 1 and 2 above the mph area (on the left side of the chrome trim ring) and gear 5 above the mph area (on the right side of the chrome trim ring). Having the 5 gears in three different sections of the speedometer make it easier to follow, as opposed to have all 5 together. 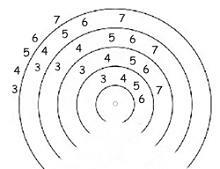 You need only numbers 4 and 6 (for 4,000 rpm and 6,000 rpm) and then you can just put in dots for the 3, 5, and 7. How does it work? I don’t know yet – it rained today…… (edit – it rained tomorrow, too). Two methods – individual numbers, or an overlay. You can stick-on individual numbers, or you can add an overlay – see below. The individual numbers are probably better if your vision is not so great. The overlay is not as easy to read, but if your vision is really good, you might like it. The overlay would be better is the numbers were bigger and if you put it inside the speedometer – that way, it would not hide the speedometer needle and it would be out of the elements. Most people would just buy a tach if they wanted one – this idea is for someone who is short on funds. It is easy to read (once you get used to it) and is accurate. Here are two overlays for the Virago 250 speedometer for 17/40 sprockets and stock front tire. The outside numbers are 1st gear rpm. 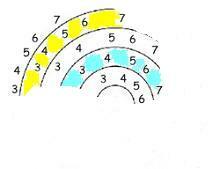 The innermost numbers are 5th gear rpm. I have to print it from “Paint” to get the right size – the printed area should measure 2 1/16 inches or 53 mm wide. Cut off the blank areas so all that all that is left is mostly the numbers. If you tape it on the glass of your speedo in just the right position for your sprocket combination, it will be accurate. For example, for 17/40, position it so that 5,000 rpm in 3rd gear lines up with 40 mph (17/38 would be 42 mph). After I use it a while, I will post a more accurate one, but this one is fairly accurate. edit 6/13/13 – The idea above ↑ is for someone who is short on funds or just wants to have a tach’s function without paying for it. 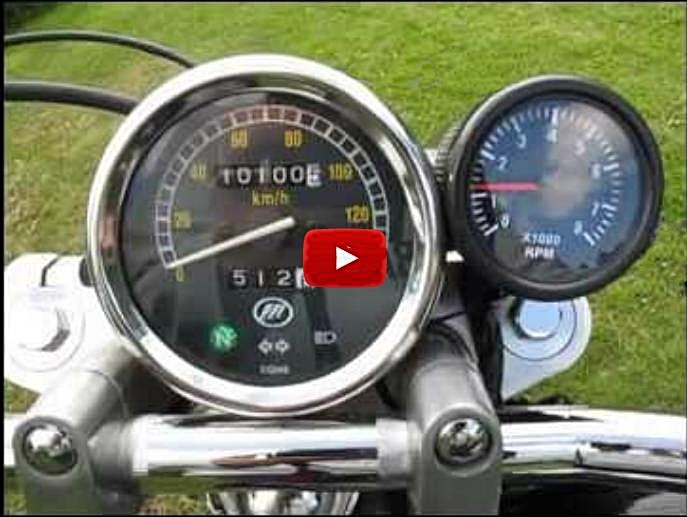 Of course, a real tachometer – a round one – would be better….. This entry was posted in Motorcycles and tagged Virago 250 17/38, Virago 250 17/40, Virago 250 cheap tach, Virago 250 speedo, Virago 250 speedometer overlay, Virago 250 speeds in gears, Virago 250 sprocket mods, Virago 250 sprockets, Virago 250 tach, Virago 250 tachometer, XV250 tach. Bookmark the permalink. If I tell a lie, I might get struck by lightning. I do not have perfect pitch, either. I recorded my bike at exactly 50 mph in 4th gear, and then compared the recording to notes on a piano. 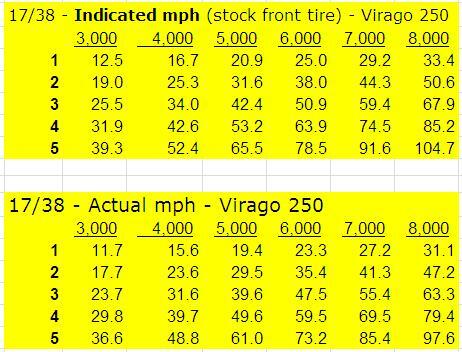 Speeds-in-gears charts already exist for the Virago 250, but I did not know if these charts were corrected for speedometer error. My 2002 Virago 250 speedometer is 6.8% optimistist, and my charts reflect that. If I bought a tach, the one that I like is almost $40, but now I don’t need it. The stick-on numbers are not perfect, but it is accurate and works as a tachometer well enough for me. -Les S.